The tool merges two (or more) databases of Lotus Notes into one 'common' mailbox. 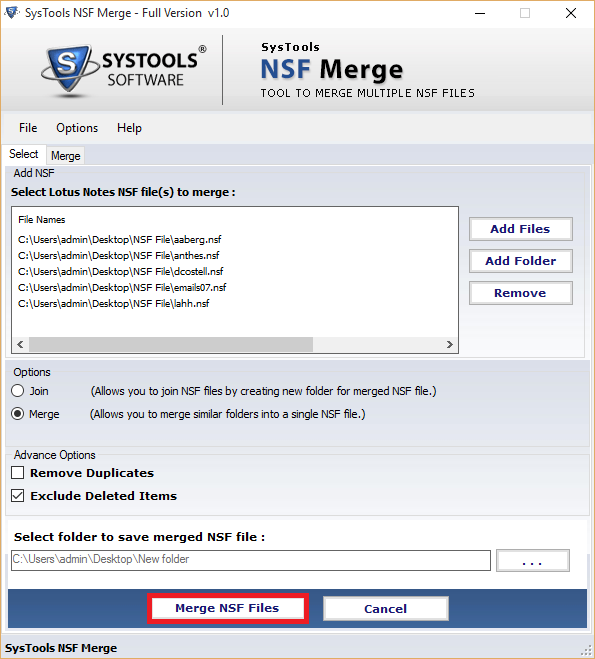 If you have multiple archives of Lotus Notes, then consolidate NSF archives using SysTools NSF Merge software. To join NSF files without combining two similarly named folders then Join NSF suits the need. Inbox1.NSF & Inbox2.NSF can be accessed separately by using the Join feature. Multiple duplicate items storing archived NSF can be merged with duplicates excluded. The tool has an option to eliminate the replicated items from a Lotus Notes archive before merge. If the size of your Lotus Notes database is increasing due access of items in the Deleted Folder, then you can choose to remove the items. As a result, the software will exclude all deleted items from your NSF. 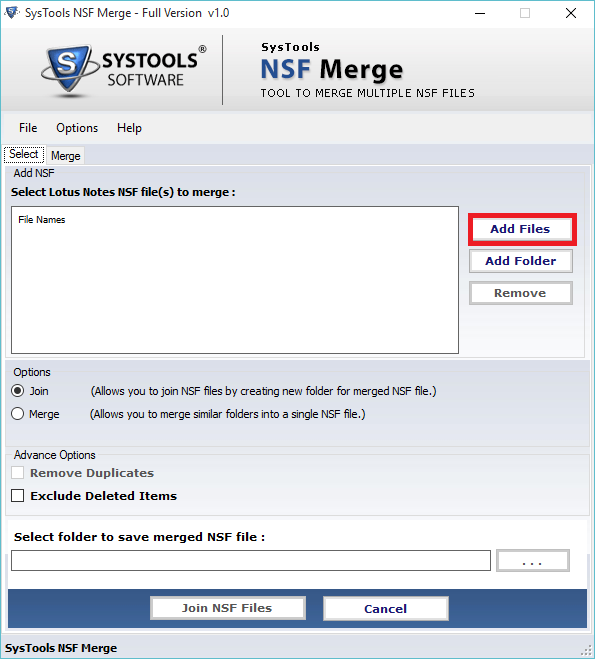 You can change the display name of a Parent Folder according to your need, which helps to manage the merge NSF files with a single Display Name that has been assigned as per the need. A live merge status is displayed while the join NSF Files software is merging or joining two or multiple NSF files. This information includes hierarchy after combining & folder of merged NSF files with removed duplicate count. The tool successfully runs with Lotus Notes 9.0, 8.0, 8.5, 7, 6 & below Versions. All Lotus Notes version are supported by the SysTools NSF Merge software. The software team up all items of Lotus Notes. Emails, Contacts, Calendar, Notes, Tasks & Journals are auto-merged. However, to merge Lotus Notes contacts, Names.nsf needs to be browsed separately. What are the main features of NSF Merge tool? Option to remove duplicate items from the NSF Files. Merge the NSF Files with existing Domino File. Combine multiple Lotus Notes NSF files & folder. Is there a way to copy Lotus Notes email folder to another by maintaing the formatting? Yes, you can copy the emails from an NSF file with another using the NSF Merge Tool. This utility is too fast to join & combine NSF Files. It just takes 15 minutes to move 650 MB of NSF to another having 5000 emails. How can I avoid the issue of duplicate elements while merging one NSF file with another using this tool? Can I merge my password protected NSF files? No, the software does not support password protected NSF file for merging. The NSF Merge Tool simply skips the password protected NSF files & merges the rest of the files. My NSF file size increases tremendously after merging 100 NSF files. Is there a way to optimize its file size? Yes, using NSF Merge tooll, the NSF file size can be optimized. The software features an option to exclude deleted items. After doing that, you will notice that your NSF file has comparatively shrunk in size. Is it possible to combine two address books of Lotus Notes together without overwriting issue? Yes, it is possible to merge two address book without overwriting both, by using SysTools NSF Merge tool. I am unable to find the contacts of Domino server in my NSF file? What to do? This is because your contacts are stored separately in Domino Server as names.nsf. Browse the Names.nsf files on the software and all the Lotus Notes contacts will be listed in a single Address book. Will I be able to merge Domino database having the file extension .nsf with an existing .nsf file? Will I be able to access all the emails in Lotus Notes? Yes, in offline mode you can copy the NSF file of Domino server to your target PC and thereby merge two NSF Files together. For the software both files are NSF files so there will be no issue in merging these two files. 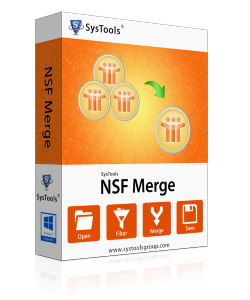 NSF Merge Tool is a great creation. I didn't hope to find a Software suiting as my requirements to merge multiple nsf file. However, when I did, I immediately tried its freeware and the satisfaction it brought me made it obvious to invest without any second thoughts. Coming across a Software that consolidate bulky Notes storage repositories without much ado and delay was something unexpected. However, my motive was to find such a Join NSF tool and that I did. Moreover, I am very glad I did! Thanks! Amazing Utility. Purchasing NSF Merge tool was worth the money and the customer support which I experienced is worth mentioning. Using the NSF merge tool, I could easily merge my personal NSF file contacts with that of the company address book without overwriting both the files. Thank you SysTools! !.